What Cortana can and still can't do in the Xbox One Creators Update. 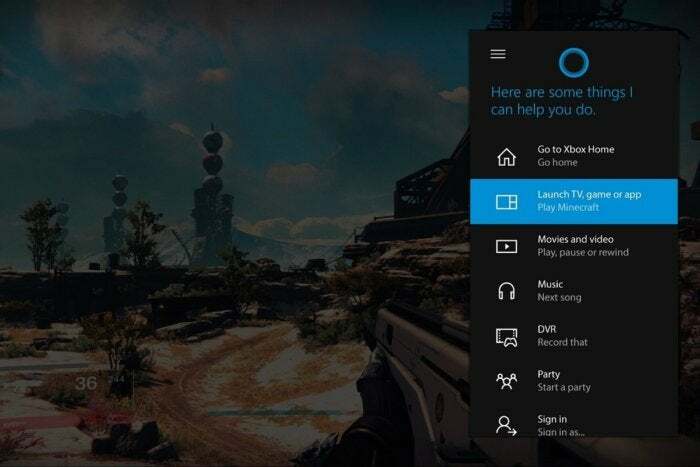 If you haven’t tried Cortana on the Xbox One, Microsoft would like you take another look. As part of the Xbox One Creators Update, Microsoft’s virtual assistant has received an upgrade, supporting some new tricks such as reminders and alarms. Still, some Cortana voice commands are more useful than others on the Xbox One. And if you’re coming from a Windows 10 PC, be aware that some commands haven’t made their way to the console. Below is a list of the Xbox One’s more useful voice commands for Cortana. To activate them, you must have either a headset microphone or a Kinect, and begin each voice command with “Hey Cortana.” For an exhaustive list of voice commands—including things you’ll probably never need to do on a game console, like calculations and stock prices—check out Microsoft’s support page. 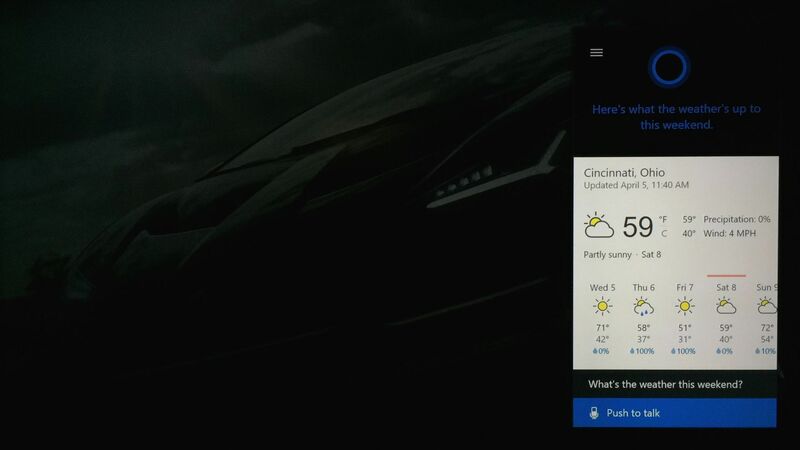 Cortana checks the weather on Xbox One. ”Friends,” “Notifications,” “Messages,” “Achievements”- Opens that section of the Guide. ”Invite [friend] to the party” - You don’t need the exact name; Cortana will look for the closest match. ”Send message to [friend]” - Cortana will then ask what you want to say. ”Record that” - Save the last 30 seconds of gameplay. ”Remind me to [task]” - Cortana will offer to set a date and time, and you’ll get notified on other devices where Cortana is installed. ”Pause” or ”Play” - Use this to control background music. ”Videos of [search term]” - Handy shortcut for watching YouTube videos through the Edge browser. 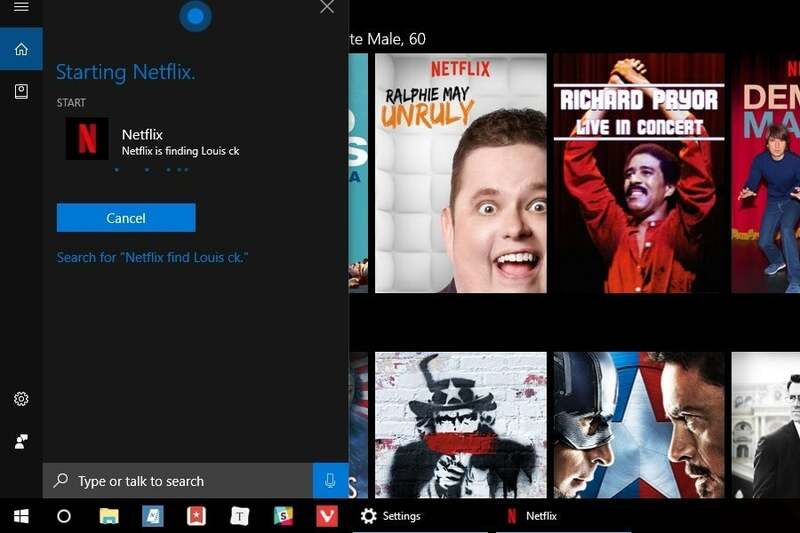 It’d be nice if Cortana could search Netflix on Xbox One like she can on a PC. ”Netflix find [search term]” - This works on PC, but not on the Xbox One. ”Read my messages” - Cortana says to check back after future updates. ”When’s my next appointment?” - Cortana says she only supports calendars on a PC or phone. ”Next track” - for background music; Cortana is oblivious to the nature of this request. ”Play [band] in Groove Music” - Cortana says she can’t play music in Groove right now. ”Play [band] in Pandora” - Cortana says she’ll play the station, but the app crashes every time. ”Listen to [band] in iHeartRadio” - Cortana acknowledges the request and opens the app, which fails to play anything. ”Turn the music down” - Cortana offers to search the web. ”[Genre] movies to rent” - Cortana opens the store but does not search deeper. We hope Cortana will improve over time as she becomes a bigger part of the Xbox experience. For a more exhaustive list of voice commands that actually do work—including things you’ll probably never need to do on a game console, like calculations and stock prices—check out Microsoft’s support page.